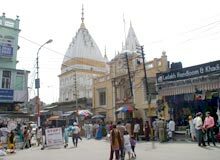 Raghunath Temple is a well-known holy shrine of the Hindus. Located in Jammu, Raghunath Mandir is one of the largest temple complexes of the Northern part of India. The temple is dedicated to Lord Rama, who is believed to be an incarnation of Lord Vishnu. In 1835, the construction of this temple was started by the founder of Jammu & Kashmir, Maharaja Gulab Singh. After the death of Gulab Singh, it was completed by his son, Maharaja Rambir Singh in 1860. One can easily reach this temple from Srinagar/ Jammu Airport by hiring taxis or by taking regular buses from the cities. The huge temple has seven shikhars (spires), where every shrine has its own shikhar. On the very entrance of the Temple, a portrait of Maharana Ranbir Singh and an image of Lord Hanuman embellish the site. The central shrine is dedicated to Lord Raghunath/ Rama, who is the presiding deity. Apart from the main shrine, the other shrines encompass various incarnations of Lord Vishnu. There is a shrine of Lord Surya (Sun God), which is another striking shrine. There are many idols of different forms of the God. Inside the temple, there are other shrines that house huge statues of the Hindu Gods and Goddesses. It is noteworthy to mention that gold sheets cloak the interior walls on three sides of this temple. It also has a gallery, where various 'Lingams' (phallic form of Lord Shiva) and 'Saligrams' are placed. Raghunath Temple comprises almost all the images of the Hindu Pantheon, which is quite uncommon. The sermons and rituals of the temple include both morning and evening Aarti. A glimpse of Mughal artistry can be seen in the architecture of Raghunath Temple. The carvings and arches are really beautiful and grasp the major attention. There is a library in the temple complex, where rare Sanskrit manuscripts are kept. People visit this temple in large numbers to pay their homage to the deity and get the blessings from the God.